Although it’s a place to relax and refresh, the bathroom is one of the rooms we pay the least attention to. 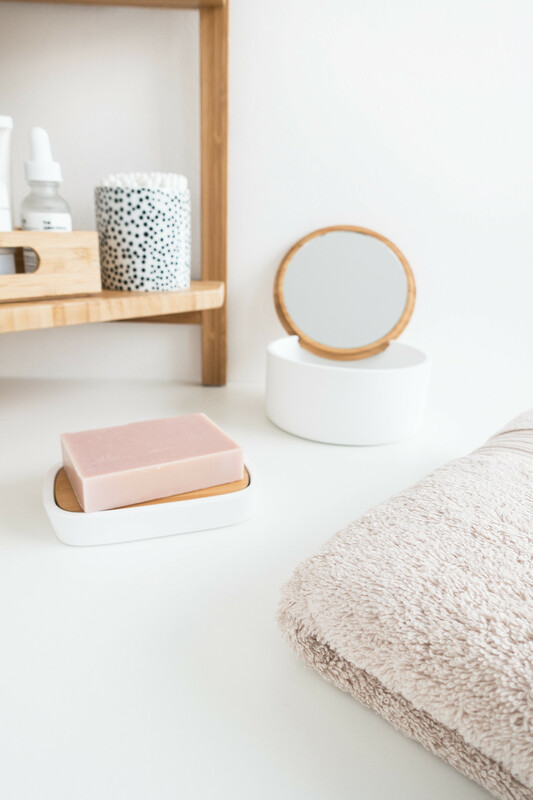 It’s important to keep this space clean, tidy, and fresh; a minimal bathroom tends to use essential products as if they were decoration, to keep the space uncluttered and yet inviting but it can easily be forgotten about. After updating our bedroom, it felt like a good time to focus our attention on the bathroom. After a few years the space was calling out for a refresh. 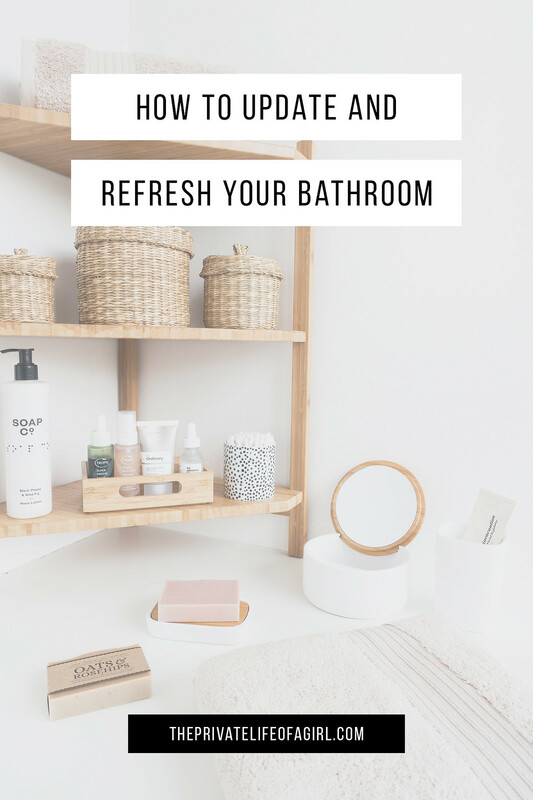 The majority of our bathroom essentials were purchased out of necessity before we moved into the apartment; before we had a chance to figure out how we wanted to style our space. Updating and refreshing this space brought the bathroom’s theme into alignment with the rest of our apartment and, with a few small tweaks, made a huge difference with minimal effort. Bathrooms take very little effort to maintain, aside from cleanliness and tidiness, updating and refreshing the details is all it takes to restore and freshen the space. A few quick and easy upgrades can make a huge difference. Towels are one of the first things to show signs your bathroom is need of a refresh especially if they aren’t so great quality to begin with. Investing in a quality set of towels made from durable yet soft fabric means they’re likely to stand the test of time and the abuse of everyday use. They also add a whole other level of luxury to such an important room in the home. Although we invested in a set of quality cotton towels, our back ups were of cheaper quality and were, unsurprisingly, starting to show their age. Choosing to replace our old towels was a no-brainer and one of the first things on the list to update. We upgraded to a set of Soak & Sleep Luxury Bath Towels and matching Hand Towels. 100% Egyptian Cotton is known for its quality, the fabric is dense and luxurious to the touch; cotton towels are strong, durable, and absorbent. There’s nothing quite like stepping out of the shower into a soft-as-a-cloud towel and investing in a quality set easily adds a spa-level of luxury to a bathroom. Coordinating the accents of any room adds an attention to detail that brings everything together seamlessly. In a bathroom, it’s easy to overlook these elements and mismatching items really show. 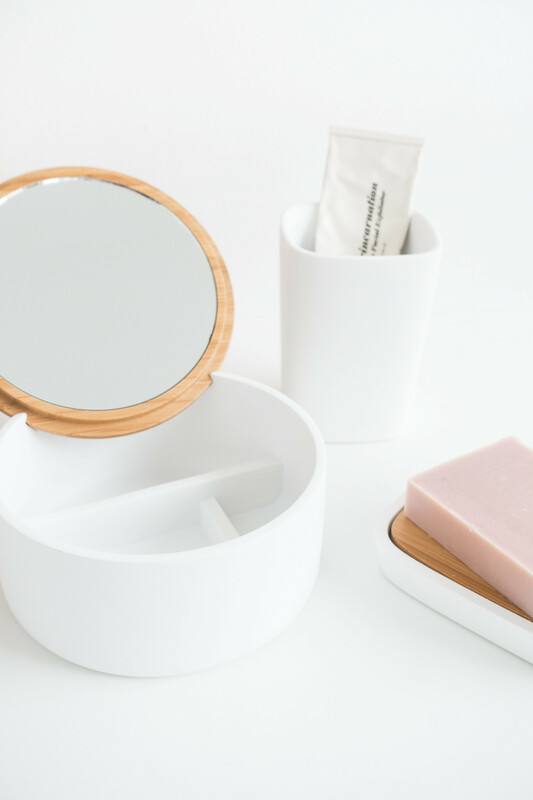 The simple accessories found in almost every bathroom are hardworking and yet often overlooked; they don’t necessarily ‘spark joy’ and they might be considered boring but they certainly have their place and serve a purpose. We've developed a strong theme in the rest of our apartment and we wanted to make our bathroom more cohesive by bringing it in line with the rest of our space. Our bathroom accessories had served their time and were looking pretty beaten; replacing them with more appropriate alternatives was the only option. 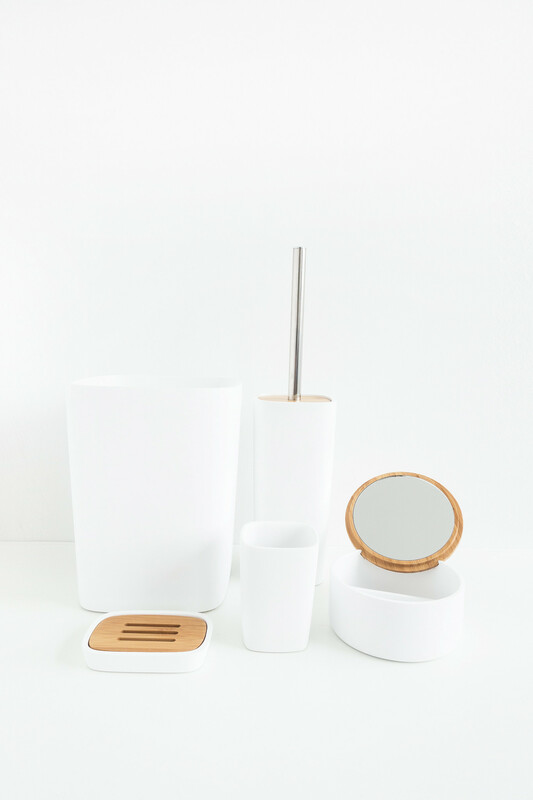 Soak & Sleep’s range of White Bamboo Bathroom Accessories were the perfect solution, they match our apartment’s theme perfectly. Made from polyresin, these accessories are stronger than traditional ceramic and have a beautiful matte finish. The combination of white ‘ceramic’ in organic shapes with bamboo accents creates an effortless style that’s natural and modern. 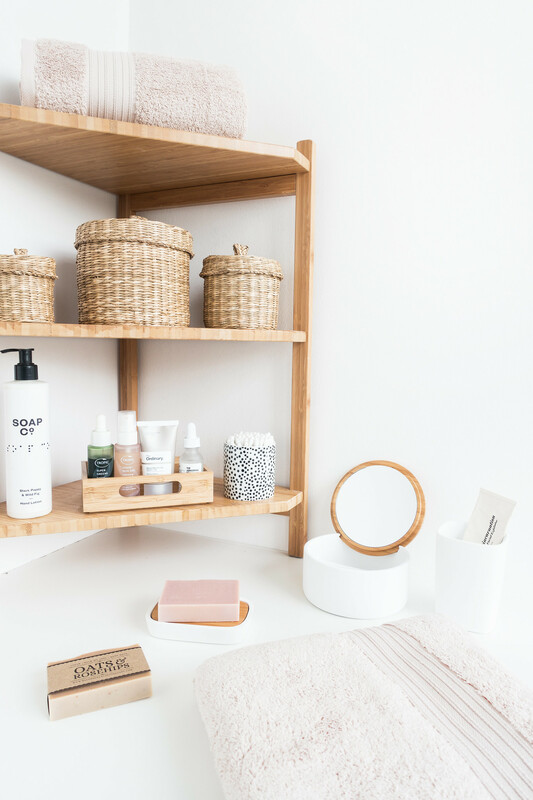 Streamlining beauty and grooming products by eliminating any unnecessary items, using products up and avoiding owning duplicates is crucial for maintaing the serenity of such a private space. Making room and providing storage for only the most essential items prevents clutter and keeps a bathroom feeling fresh and looking inviting. 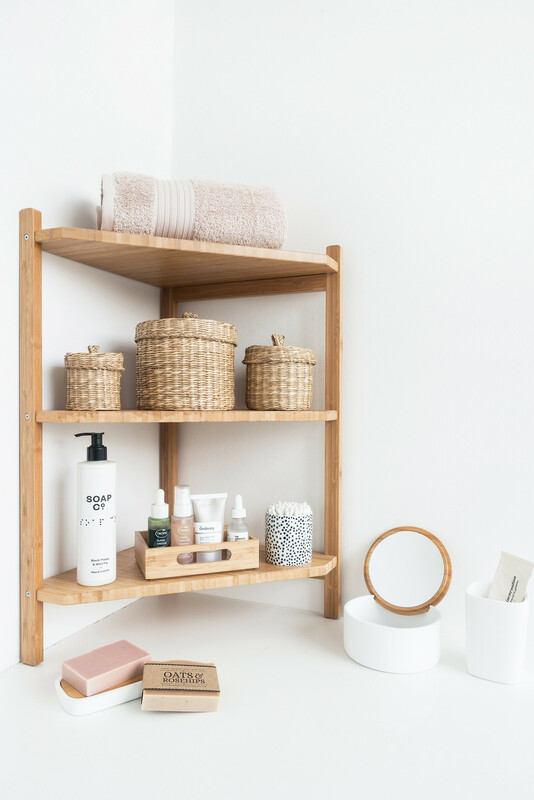 Picking the right storage for a bathroom is a blessing. Anything too small doesn’t solve any issues and anything too big can look out of place and messy; choosing the right storage for the right space is crucial to getting the balance right. While our bathroom has a built-in shelf running the length of the room, making use of the vertical space has really changed the way our bathroom looks and functions. Instead of a sprawling line of products, we’ve tucked things away on a neat corner unit and hidden others in little wicker baskets. Open storage solves the issue of keeping things tidy and organised without resorting to bulky and cumbersome storage that would look out of place in such a small space. One step we took to make our apartment a little more ethical was to switch to green household products. We’ve slowly been applying this to all areas of our home including the bathroom. A simple replacement that required very little transition was replacing both our hand wash and shower gel with traditional handmade soap. Bar soap is better for the environment (and your body) than liquid soap plus it’s cheaper, lasts longer, doesn’t use plastic packaging, and can be kinder to your skin. A 120g bar can last a few months, and splitting each bar into two makes them easier to use. My favourite places to pick up new bars are Ravenscourt Apothecary Co. and Soap Co. both are independent businesses providing beautiful handmade, environmentally friendly products. I recently replenished our stock with two new varieties: a bar of English Rose soap for hand wash and a bar of Oats & Roseships soap for the shower. Synthetic rose scented products have a tendency to smell stuffy and old fashioned; Ravenscourt Apothecary Co. uses uses high quality essential oils, which provides a soft floral fragrance that smells natural. The Oats & Roseships soap works as a natural moisturiser to help helping with dryness while rosehip oil nourishes the skin. The combination calms irritation, exfoliates, and is kind to sensitive complexions.